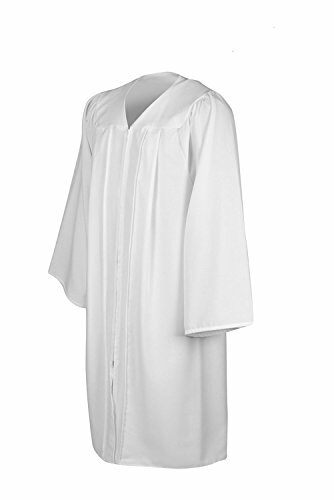 This 78 classic white choir robes combines beauty and drape of the finest gowns, can be worn for baptisms, on the pulpit, sorority, officiate weddings even at church, impart pride and confidence in thousands of American choirs. Made of 100% polyester matte in classic styles choir robe, the backview diplays a square yoke, they are tailored for comfort, easy care and dignified appearance. Machine wash and tumble dry. Change the look by adding a stole. An excellent choice for choirs with changing membership. Add a stole, please contact us for details in savings. Suitable for men and women; Any many size worked on, choir robe size choose by chest size and height(Please see size guide or contact us for more size). This choir robe help your choir sound great by making it looks great. Choir robe designed generous pleats extend around yoke, front across back, over shoulders;Fluent zipper with same color as the choir robe; comfortable to wear. Unisex adults choir robe for men and women; Any many size worked on. Choir robe size goes mainly by height, and there are "FF" options for people who consider big&tall member. Choir robe shipped with 1-3 business days. Robes can be returned or exchanged. If you have any questions about this product by Leishungao, contact us by completing and submitting the form below. If you are looking for a specif part number, please include it with your message.